How do people around the world make music? In some really amazing, beautiful, and diverse ways! The instruments used to make music around the globe are also quite diverse and often made from unique materials. Some are crafted from dried gourds, bones, bamboo or from wood. There are also instruments that use repurposed items – such as the cajón from Peru. This “box drum” was originally made in secret from shipping boxes and dresser drawers when slaves were forbidden to use their African-style drums. If you add a set of thimbles to a washboard, you turn a household tool into a percussion instrument! It’s easy to see how common items can take on new usages and meaning. There are also some modern ways or recreating ancient instruments. Didgeridoos; originally from Aboriginal culture of Australia, can now be found all over the world. Instead of the original didg made from a tree branch hollowed out by ants, some are made from pvc piping – the type found in most modern bathrooms. Other unique ones I’ve seen in my travels include one made from a long tube and an orange traffic cone and one made from used crushed, metal Chinese food containers. People have gotten really creative in making and remaking instruments – often with the coolest recycled materials. And you can to! 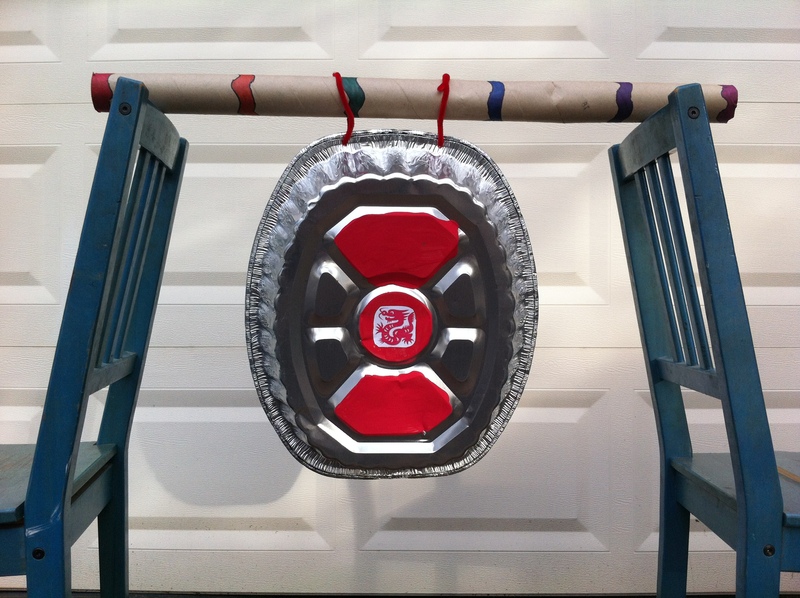 Here’s a list of our favorite recycled instrument crafts along with the materials you’ll need to create them for yourself. Materials: Either a wire coat hanger or a tree branch shaped like a “y”, jewelry wire or any thin wire, beads, jingles, buttons or other “jangley” objects. Would you like to see 10 of these ideas in a step-by-step format with illustrations and photos of the projects plus instruments? 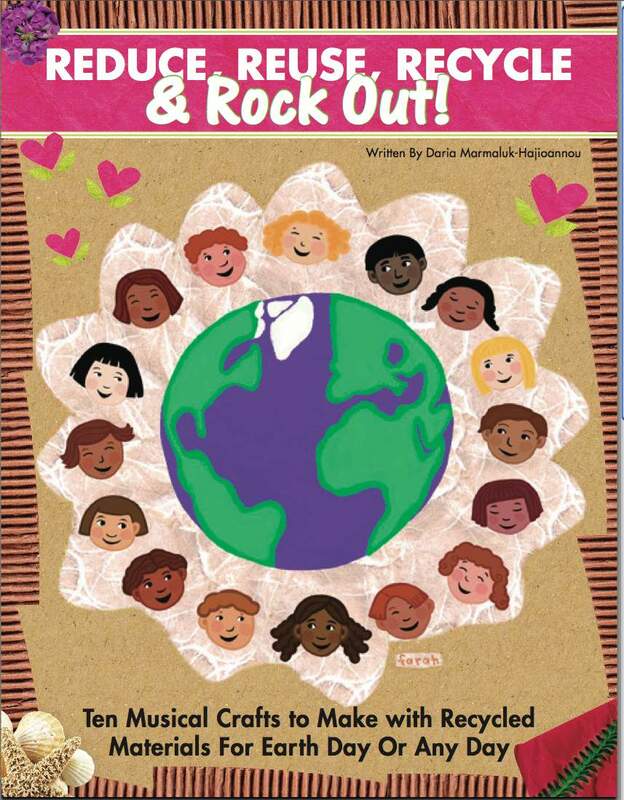 I’ve just published an e-book called Reduce, Reuse, Recycle and Rock Out! It’s available from Teachers Pay Teachers and from my Little Village Store at the links below. This entry was posted in Crafts, Earth Friendly Music, Musical Instruments, Uncategorized and tagged cajita, Cajon, Didgeridoo, gong, green kids crafts, Guiro, Kalimba, kids crafts, kids musical crafts, maracas, mbira, ocean drum, Recycled, Recycled crafts, Recycled musical instruments, recycled rattles, shekere, sistrum, Washboard, world music for kids by dariasblogs. Bookmark the permalink. Great, great, great! Thanks for the ideas! MCCA’s Bridges magazine (Manitoba Child Care Association) would like to use the examples of world musical instruments in our fall 2012 issue. How do I go about getting permission to use these activities and picture? Are there copyrights we need to consider? Congratulations Daria – you’ve been featured at Inspire Me Monday at Create With Joy! I really loved your article and hope you’ll continue to inspire us with your music and creativity! I love your music and creativity and I hope you’ll continue to inspire us each week! This is very, very cool. Thank you for sharing all this! I look forward to making some of these with my kids & their friends. Pingback: Balloons and Sustainability: What's an Eco-Parent to do? Thanks for your great ideas i will look forward to using them in school! This is incredible stuff… Amazing ways to transform life!! I really love the Maracas idea. I think these would be really fun to add to our dance lessons with the very little ones. The fact that they are made from recycled products makes them even better!